Impacts of mycotoxins on farm animal performance and health are generally well known. However, what is often less well known are mycotoxin kinetics and the metabolism of mycotoxins, when they pass through the digestive tract. Based on the current scientific literature, this is also an area of research that still requires greater understanding. Considering that most dietary mycotoxin solutions will act on mycotoxins in the gut, it is important to understand the time window for action available in the gut. Increasing knowledge of mycotoxin kinetics and metabolism highlights that speed can be a critical characteristic for the mode of action in mycotoxin solutions, as well as the location for mode of action in the animal’s body. The pharmacokinetic behaviour of an orally ingested compound determines how readily it is absorbed from the gastrointestinal tract, which concentrations are reached in the various organs, and how long the agent and its metabolites will stay in the body. These aspects are of prime importance for the biological effects and risk assessment. 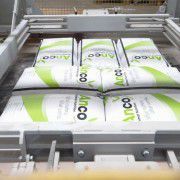 1) Whether absorbed into the systemic circulation or not, the cells of the gastro intestinal tract (GIT) will potentially be exposed to the full range of ingested mycotoxins and in the highest concentrations. 2) Mycotoxins that are rapidly adsorbed can cause damage in other organs and their metabolism can result in more toxic metabolites as well as waste of metabolic energy. 3) The pace at which mycotoxins will be adsorbed from the gut, will affect the time window for dietary mycotoxin solutions to act on mycotoxins in the gut. 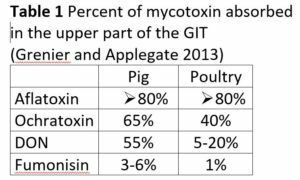 Mycotoxin uptake and subsequent tissue distribution is governed by GIT absorption. This passage across the intestinal barrier may be maximal, as with aflatoxins or very limited, as with fumonisins (Table 1). The rapid appearance of most mycotoxins in the circulation suggests, that the majority of the ingested toxin is absorbed in the proximal part of the GIT. Absorption of deoxynivalenol (DON) is on average 55% in pigs, but very limited in poultry (Table 1). The relative tolerance of poultry to DON has been partly attributed to its low bioavailability. However, the potential impact of the remaining DON in the intestinal lumen is still unknown, and the tolerance level within the GIT might be different. Further details on DON kinetics and metabolism are discussed later in the text. In pigs zearalenone and its metabolites were found in the plasma of a pig less than 30 min after the beginning of feeding. The first reported mammalian phase I metabolites of ZEA are the stereoisomers of zearalenol (ZOL) – α-ZOL and β-ZOL. α-ZOL is 92 times more oestrogenic than ZEA. β-ZOL is 2.5 times less oestrogenic than ZEA. 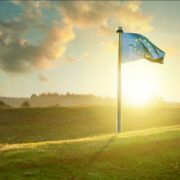 The metabolization of ZON occurs primarily in the liver, but a variety of organs show metabolization activity, such as intestine, kidney, ovary and testis. Observations in pigs indicate that ZEA is rapidly and efficiently absorbed after oral intake and metabolised to ZOL and glucuronides of ZEA and ZOL. The glucuronides are efficiently eliminated into the bile, but hydrolysed in the intestine and the aglycones reabsorbed, accounting for the secondary peaks in plasma level. The extensive enterohepatic circulation of ZEA and its metabolites slows the excretion and extends the half-life of this mycoestrogen in the pig. The enterohepatic recirculation of ZEA and α-ZOL was confirmed in a later study on the fate of a single dose of ZEA administered intravenously to young female pigs (Dänicke et al 2005). In broilers, a large proportion of ZEA was changed into. α -ZOL and β -ZOL in the plasma and various tissues of broiler chickens following oral administration of ZEA. This suggests that ZEA was absorbed and metabolized rapidly. The absolute oral bioavailability of ZEA was 29.66% and was higher in broilers than in rats (2.7%) ZEA is excreted largely in the form of α -ZOL in the excreta of broiler chickens. (Buranatragool et al 2015). In another study, the rate of reduction of zearalenone into α- and β-zearalenol was compared in geese, ducks, guinea-fowl, chickens, laying hens, and quail. Zearalenone reduction was lowest in geese and highest in quail. Although α-zearalenol was the main metabolite formed in all the avian species, the α:β ratio ranged from 1:8 in quail to 5:3 in chicken (Guerre 2015). In ruminants, the nearly complete recovery of ingested ZON at the duodenum as a-ZOL, b-ZOL and ZON suggests only a minor complete degradation in the rumen under steady-state conditions or some interference with an intensive entero-hepatic cycling of these substances (Dänicke et al 2005b). 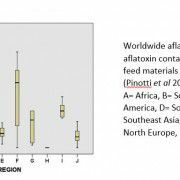 Following ingestion, aflatoxin B1 (AFB1) more than 80% is rapidly absorbed in the intestinal tract in both poultry and pigs. The duodenum was found to be the major site of absorption. From the site of absorption, AFB1 enters the blood stream and is transported to the liver, the major site of metabolism. Metabolism of AFB1 can be divided into three phases, bioactivation (phase I), conjugation (phase II) and deconjugation (phase III), all of which can occur directly at the site of absorption, in the blood, after entering the liver as the main metabolizing organ, or in several extra-hepatic tissues. Aflatoxin B1 itself is not a potent toxin, and phase I bioactivation is needed to exert toxic effects. Phase I reactions are mainly oxidation of AFB1 to hydroxylated metabolites such as aflatoxin M1, aflatoxin Q1 and aflatoxin P1 and to the highly reactive AFB1-8,9-epoxide. Cytochrome P450 enzymes (CYPs) are known to play the major role in oxidation of AFB1 to the reactive epoxide in many tissues. Phase II metabolism includes conjugation of phase I metabolites with glutathione or glucuronic acid and is considered detoxification to enhance water solubility and excretion. Conjugates of epoxide and hydroxylated AFB1 metabolites are readily excreted via the bile into the intestinal tract, where they might be subject to bacterial deconjugation as phase III reaction. The major route of excretion of AFB1 and its metabolites is the biliary pathway, followed by the urinary pathway. In lactating animals, AFM1 and other metabolites are excreted in the milk. After oral intoxication of pigs, DON starts to appear in the plasma after 30 min. A study on bioavailability of DON in pigs revealed that DON was rapidly absorbed following oral exposure and reached maximal plasma and serum concentrations after 99.1 min. The mean bioavailability of DON was 54%. DON was highly distributed and poorly metabolized. (Goyarts and Dänicke 2006). In avian, species the levels of DON in plasma following oral administration are relatively low, recent results suggest that DON is highly metabolized, leading to the formation of sulfates, which are a detoxified form of the toxin. This metabolism differs from that observed in some mammal species, in which de-epoxidation is recognized to be the most important step. Although the persistence of DON in tissue and its transmission to eggs are limited, the metabolites of the toxin, especially 3α-sulfate, should be measured (Guerre 2015). In ruminants, the low recovery of DON at the duodenum as de-epoxy-DON and DON would indicate either a nearly complete degradation of the molecule in the rumen and/or absorption at this site of the digestive tract (Dänicke et al 2005b). However, detoxification capacity for DON by rumen bacteria can be compromised in high producing dairy cows, which are fed greater amounts of concentrates and where feed passage rate is high. Both conditions will affect rumen pH and the time available to degrade DON into non-toxic metabolites. Low rumen pH has a negative impact on the rumen microbes that would otherwise detoxify DON. Jeong et al (2010) report that high concentrate to forage rations reduce the amount of DON detoxified by rumen bacteria by 14%. Similarly, Hildebrand et al (2012) observed that DON can negatively influence rumen fermentation and microbial protein synthesis to a greater extent in high concentrate rations than in low concentrate rations. The rank order of sensitivity of animals to ingested DON is pigs > poultry/ruminants. Intestinal explants (cultured tissue samples) from poultry and pigs possess a similar ability to intestinally absorb DON, suggesting that the difference in their sensitivity to ingested DON does not rely on their ability to intestinally absorb DON. It is more likely that the sensitivity of animals to oral DON relies on the localization of the intestinal bacteria in their gut in relation to their ability to generate 9,12-diene DON or DOM-1, the non-toxic de-epoxide derivative of DON (Maresca 2013). The presence of high bacterial contents that can convert toxic DON into its non-toxic de-epoxide metabolite DOM-1 before the small intestine in ruminants (rumen-associated bacteria) and poultry (crop-associated bacteria) hugely decreases the amount of native DON reaching the small intestine. In pigs, due to the high absorption of DON by the small intestine, bacterial transformation of DON in DOM-1 could only be possible if a part of the ingested DON reaches the colon and/or in the case of intestinal/hepatic excretion of absorbed DON. Scientific data suggest that the toxicokinetics of fusariotoxins in avian species differs from those in mammals. The use of radio labelled DON, T2-toxin, and zearalenone revealed high biliary excretion of these toxins whereas the amount of the parent compound in plasma was low. This observation and the low level of radioactivity found in tissues led to the conclusion that fusariotoxins are weakly absorbed and rapidly eliminated in birds. 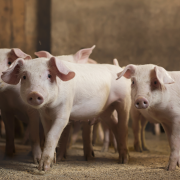 The message from the scientific literature is that the potential time window for action on some mycotoxins in the gut is short – for zearalenone in pigs 30 minutes or less, before they get absorbed into the blood system. 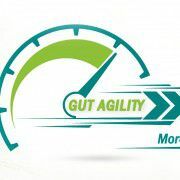 The consequence is that speed is of great importance, when it comes to solutions that act on mycotoxins in the gut to counteract their harmful effects. The alternative is that they also should be able to act on the mycotoxins or reduce their impact outside of the animal’s digestive tract, i.e. in the blood system or other target organs for mycotoxins in the animal. Traditionally, feed additives have been developed to attack mycotoxins in the animal’s digestive tract directly to counteract harmful effects from mycotoxins in the animal. However, both mycotoxin binders and mycotoxin deactivators have their limitations. It is well known that adsorption is not an effective strategy for most mycotoxins. Only certain bentonites work well with aflatoxins and some yeast cell wall components have been proven to bind zearalenone, based on specific structural fits. For other types of mycotoxins, particularly DON, binding strategies do not work effectively. Biotransformation of mycotoxins is another strategy that directly attacks mycotoxins to transform their structure into non-toxic metabolites. Again, this strategy is very specific to certain target mycotoxins. On top of that, it takes time to complete the biotransformation of mycotoxins and time to do so in the digestive tract is limited. Find out how long it takes to transform mycotoxins in vitro in this scientific paper. The question is, how does the animal deal with the mycotoxins left untouched by the highly specific feed solutions mentioned above? This strategy is not a direct attack on mycotoxins, but it helps the animal to shield itself efficiently from the negative effects of a broader range of mycotoxins, when challenged. It is non-specific for mycotoxins, but highly specific on the side effects of the most important mycotoxins. Maresca (2013). From the Gut to the Brain: Journey and Pathophysiological Effects of the Food-Associated Trichothecene Mycotoxin Deoxynivalenol. Toxins (Basel); 5(4): 784–820. 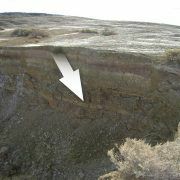 Metzler et al (2010). Zearalenone and its metabolites as endocrine disrupting chemicals. https://www.anco.net/wp-content/uploads/2017/03/DON-mycotoxin-kinectics-1.jpg 340 770 Anco https://www.anco.net/wp-content/uploads/2019/04/anco_Logo-300x110.png Anco2017-03-22 10:00:302017-04-10 14:59:02Mycotoxin kinetics: Did you know how quickly mycotoxins disappear?